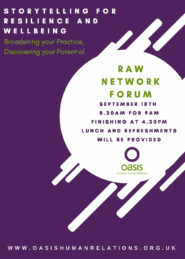 Resilience and Wellbeing Network members and guests are invited to the RAW Forum. Update on the network’s first nine months. Shape a narrative around a RAW year. Share your questions about resilience and wellbeing. Joining us will be guest facilitators Glyn Fussell and Sonia Mayor. Glyn is a leadership developer with experience at all levels from Cabinet office to front-line practitioners. Sonia is working at the leading edge of somatic resilience and wellbeing techniques. They will be drawing out different dimensions of resilience and wellbeing through participative sessions that you can apply in your work setting. The morning is open to members and guests of the network, with 3 places available to each organisation. There also guest places available. The afternoon is for members only. To find out more, please speak to Lise Ribeiro on 01937 541700 or drop her an email.